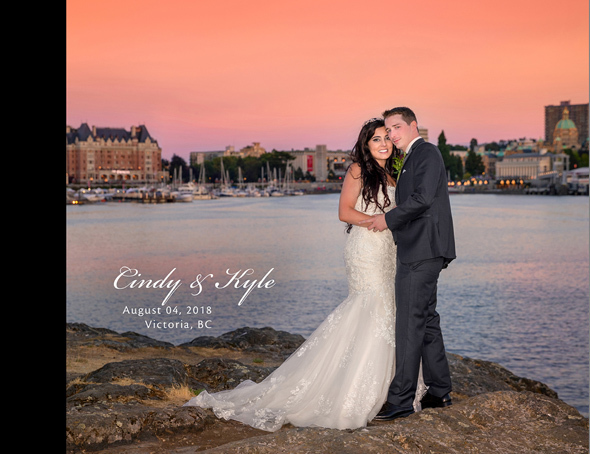 Cindy and Kyle’s wedding took place on August 04, 2018 in Victoria, BC. The ceremony was held at Victoria’s beautiful Delta Ocean Point Resort which is located across the harbour and also directly across Legislature. It was a beautiful sunny day, all day. Bride’s preps started at the parent’s home, and then we went to Delta Ocean to photograph the Groom and Groomsman before the start of the ceremony. I love stairways at Delta Ocean which lead to the ceremony location. When the bride is walking down the stairs, here is a spectacular view with dress stretching on the stairs plus a beautiful architectural view. Bill Smith, one of my favourite marriage commissionaire, performed wedding special moments, the wows, the rings and the all the charm that goes with it, it just could not have been any better. Then, we photographed the entire wedding party, all attendees, in both the formal and fun way, followed by the family portraiture. After family portraits, we then went to the back of the legislature where we photographed bridal party and the fashionable portraits of the bride and groom. The reception took place also at Delta Ocean Resort with a beautiful set-up. Towards the evening hours, we went out to capture panoramic view portraits. The reception was both emotional and joyful with meaningful and fun speeches followed by the first dance, dance with the parents and the full-blown dance till the end of the wedding night. After the wedding, I created a presentation with their wedding photography, and they decided to have me start on a wedding Fine Art Book. To do so, the first step I take is retouching and enhance every image that is selected to go in the book, then design layout to follow and after that it’s production takes place at the facility in New York City which is now a work in progress. Below are samples of the wedding book design layout. Worth noting, I have also photographed Cindy’s sister’s (Melissa) wedding and that I’ve got to know their wonderful parents; Jack and Maria. Simply put, they’re the most wonderful people I’ve come across. I feel very privileged to have been an important part with special days (weddings) in their lives. I wish Cindy and Kyle as well as their parents the very best. Thank you, Lilo at Lilo Photodesign.